Insurge Intelligence, a new crowd-funded investigative journalism project, explores the dystopian implications of Britain’s new Counter Terrorism and Security Bill, and the efforts to rush it through without public scrutiny. Counter-terrorism experts who have worked on the frontlines of the UK’s battle against extremism reveal exclusively to INSURGE how the proposed new powers, far from making Britain safer, will criminalise legitimate political dissent and fail to prevent the next terrorist attack — despite generating stupendous profits for a parastical security industry. In the UK, an insidious secret network of violent extremists is plotting to subvert democracy. The members of this network detest our way of life, and hate our freedoms. Walking amongst us, this dangerous fifth column is exploiting the very laws we hold dear to campaign for the establishment of an extremist, totalitarian state that would police every aspect of our lives based on a fanatical ideology that is devoid of reason. No, the ‘Islamic State’ is not about to conquer Great Britain. But the neocons in government and industry who profit from fear might well be. 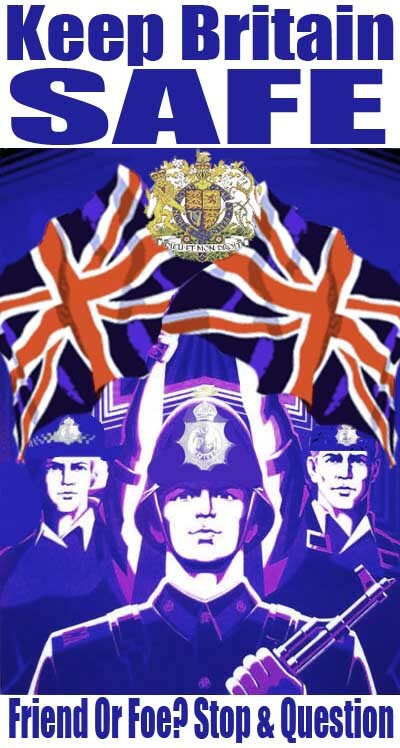 In the name of fighting terror, the UK government, hand-in-hand with the US, is leading the way to turn freedom of speech and dissent into mere formalities that, in practice, have no place in societies that will function, effectively, as full-fledged police-states. Today, the British government’s controversial Counter Terrorism and Security (CTS) Bill received Royal Assent, after having been passed by the House of Commons on 10th February with minor amendments. “This important legislation will disrupt the ability of people to travel abroad to fight and then return, enhance our ability to monitor and control the actions of those who pose a threat, and combat the underlying ideology that feeds, supports and sanctions terrorism,” said UK Home Secretary Theresa May. The powers of the new legislation are unprecedented. The government will be able to unilaterally confiscate passports of British citizens suspected of involvement in terrorism, although the threshold for what exactly constitutes a reasonable suspicion is ambiguous. Terror suspects, deemed as such not on the basis of a fair trial, but purely through secret ‘hearings’ based on secret evidence provided by security service ‘assessments,’ can already be subjected to constant monitoring, electronic tagging, travel bans, limited house arrest, and curfews under Terrorism Prevention and Investigation Measures. The CST bill will now add forced relocation to that mix. Police and security services will have enhanced powers of surveillance, including the ability to identify the devices that send communications over the internet. But perhaps the most outrageous element of the CTS bill is the ‘prevent duty,’ the establishment of a statutory duty on all public sector workers — teachers, lecturers, nurses, GPs and other professionals — to prevent extremism in their institutions. They will have to do that by monitoring nursery children, school children, students, patients, and so on for signs of being at risk to radicalisation. The ‘prevent duty’ puts the Home Office’s Channel Programme, a scheme coordinated by the Metropolitan Police in certain parts of the UK, on a national legal footing. Under the programme, individuals identified as extreme, or being ‘at risk’ of extremism, must be referred to Channel, which will make an assessment to determine whether the referred individual requires an intervention to deradicalise them, and the kind of intervention they will make. In 2013, I revealed that the Channel Programme was a covert intelligence gathering exercise. Officially, the government and police claim that people who are referred to Channel are not kept on a database. However, I was told by a former Channel coordinator at a local authority that the Programme did in fact maintain a secret logging system to store all names and profiles of those referred, contrary to public claims. Risk assessments must be “informed by engagement with Prevent co­ordinators, schools, universities, colleges, local prisons, probation services, health, immigration enforcement and others.” The guidance also demands the same from university institutions in “assessing where and how students might be at risk” from violent and non-violent extremism. Whereas previously, Channel Programme officers have gone to pains to deny the storage of such information about people suspected of being “at-risk,” the government’s new guidance repeatedly does the opposite, setting out the need for robust procedures for “internal and external information sharing” between agencies “about vulnerable individuals.” The upshot is that the new bill is designed to slip through by stealth the legalisation of ongoing storage of risk assessment profiles of referred individuals. This definition, though, which was criticised last year by Greater Manchester Police chief, Sir Peter Fahy, as being so vague it had turned police into “thought police,” opens the door wide to casting suspicion on anyone raising ideas critical of British policy. In its submission to the British government’s Prevent guidance consultation process last month, the London-based Campaign Against Criminalising Communities (CAMPACC) noted that anti-terror legislation had already been abused by the government to support “oppressive regimes allied with the UK” and to persecute opponents of those regimes inside Britain. Prevent funding was originally allocated to 30 areas in England and Wales based purely on the size of their respective Muslim populations: the potential for terrorism, in other words, was considered proportional to the number of Muslims, as opposed to any other criteria. Recently, other areas have been allocated Prevent funding due to evidence of young Muslims traveling abroad to fight in Syria and elsewhere. British Muslim grievances over US-UK involvement in crises in the Muslim world, which are widespread, are increasingly being seen as equivalent to extremism. The government’s blanket equation of criticisms of government policy in the Muslim world with a propensity to violent extremism, leads experts to raise concerns about the unwarranted demonisation and criminalisation of political dissent. The Orwellian implication is that Britons who are critical of Britain’s policies in the ‘war on terror’ are extremists who must be shut down and deradicalised. Other counter-terrorism experts have raised probing questions about whether the new powers will even work in any meaningful way to address the risk of terrorism. According to Jahan Mahmood, a former unpaid adviser to the Home Office’s Organisation for Security and Counter Terrorism (OSCT) who works on deradicalisation with young Muslim men in Birmingham, the new measures are so broadly defined that they will specifically exacerbate the risk of criminalising British Muslims. “The problem at the moment is that Muslims are widely perceived as being synonymous with terrorism due to media stereotypes and the government’s own approach to the Prevent agenda,” Mahmood told me. Mahmood’s principal concern is that this sort of approach is inherently prone to mistakes that could be counterproductive. “With pre-emptive terrorism investigations, you’re operating in a ‘pre-crime’ space where you have to identify the potential for crime, rather than actual crime,” he said. Some years ago, a leaked MI5 behavioural study of pathways to terrorism concluded that there was no single profile or pathway to violent radicalisation. It also found, contrary to conventional assumptions, that religious conservatism tended to act as a bulwark against extremism. One of the case studies of a successful instance of preventing terrorism concerned a female Muslim pupil who wrote about her belief that homosexuality is ‘haraam,’ a sin. She was referred to Channel and provided an intervention which, supposedly, dealt with this. The teacher who mentioned this example provided by the trainers expressed confusion as to how this was linked to preventing terrorism, and told me that dealing with such issues was something done routinely in schools. The episode shows that even without mentioning religion, filtered through the preconceptions and fears of individuals in the public sector, the implementation of the ‘prevent duty’ referral programme could end up being discriminatory toward Muslims. The new legislation will also grant “Prevent co-ordinators” extraordinary powers to “monitor” and “enforce” the implementation of the new laws in schools and universities. Current drafts of the government’s proposed ‘prevent duty’ guidance to be given to public sector institutions, show that a particular focus of the monitoring will be not just the hosting of external speakers, but also faith groups on campus and their use of prayer facilities. A trained psychologist who has worked for decades with young people and especially young Muslims on deradicalisation and, more recently, sexual violence, Dr. Karmani described the CTS bill as a “blunt instrument” which is being used “to silence and control” people in a way that would lead those genuinely at risk of being involved in terrorism to go further underground. Karmani emphasised that the biggest problem with the new powers is that by conflating increasingly prevalent social vulnerabilities with terrorism, the government will end up solving neither. Instead of new social programmes to address such issues, by associating their symptoms with a risk of ‘extremism,’ they are likely to worsen, while actual extremists will adapt, conceal their beliefs, and fall through the cracks. Karmani agrees with this. Himself a former service provider to the Home Office’s OSCT, Karmani points out that there are no proper standards to ensure the competence and independence of companies contracted by the government to deliver so-called ‘deradicalisation’ initiatives under the Prevent referral scheme. According to sources who have worked in Prevent implementing the Channel programme, contractors have an incentive to maximise the delivery of interventions, to maximise their profits — even where evidence of extremism of any kind is thin. One former Prevent officer revealed that under the coalition government, a number of highly competent practitioners who had received praise from local police for successful deradicalisation programmes were blacklisted from the Channel programme simply due to being religiously conservative. Due to Home Office pressure, police officers are no longer permitted to talk to these counter-terrorism experts, despite their exemplary track record. So, the source said, officers are forced to consult with them in secret to avoid reprimands. The source also revealed that police officers routinely use Channel providers to conduct monitoring and surveillance of communities, rather than simply to deliver social interventions. This is the case not just for Muslims, but also for for members of far-right groups. In some cases, the logic of the Prevent programme leads to absurdities. In Tower Hamlets, for instance, which has a large Muslim and ethnic minority population, the source said that social workers are under pressure from central government to implement harsh child protection measures for ‘extremist’ parents. How this pressure is exerted, he could not say. In one case, social workers admitted they were uncomfortable with the expectation from government that such measures were appropriate, and refused to move a child out of parental custody despite that pressure, because they remained convinced there was no real child safety issue involved. Preventing terror, or policing dissent? This sort of case raises urgent questions about the sweeping implications of legislation that the government is attempting to rush through with as little scrutiny as possible. Jahan Mahmood, who for three years advised Home Office counter-terrorism czar Charles Farr on deradicalisation issues and participated in regular OSCT consultations with some of the most vulnerable members of Muslim communities up and down the country, said that the coalition government has deliberately ignored its own evidence on the root causes of radicalisation. In 2010, Mahmood was involved in an extensive Home Office research process based on interviews with vulnerable individuals, which culminated in a landmark OSCT report. The report documented three primary root causes of terrorism: first and foremost, grievances with British foreign; secondly, a perception of racism and Islamophobia toward Muslims in the UK; and thirdly, a profound sense of a lack of belonging to wider British society, reinforced by awareness of entrenched inequalities and poverty amongst British Muslims. But the report was removed from the Home Office website after the coalition government took power, and its recommendations buried. The obsession with ideology — and specifically with ‘non-violent extremist’ ideology — has meant that Muslims are being disproportionately targeted by draconian anti-terror laws, the result being to compound a sense of alienation and victimhood amongst more vulnerable members of Muslim communities. The incentive behind ramping up arrests of Muslims under the terrorism legislation, said Karmani, is precisely to vindicate pre-existing counter-terrorism policy. The large numbers are cited as empirical proof that the threat is real, and thus vindication of the policy and its approach. By seemingly proving the existence of an acute threat, they justify the growth of an already multi-billion pound security industry. “The Counter-Terrorism and Security Act will make it a legal obligation on public sector workers to stop individuals from being drawn into terrorism. That is, except for the security agencies,” said Asim Qureshi, research director of the London-based human rights and advocacy group, Cage Prisoners. Why would MI5 and MI6, the very agencies tasked with protecting British national security at home and abroad, be exempt from the statutory obligation to prevent people from being drawn into terrorism? According to Shoebridge, there might be “sound operational reasons” for the exemption, namely the need to have human intelligence inside a terrorist group to learn more about it. But, he said, this may not be the only reason. There is mounting evidence that Britain, alongside the US and France, played a lead role in coordinating financial and military support to anti-Assad rebels, most of which ended up in the hands of the most virulent extremists, including al-Qaeda and ‘Islamic State’ (IS). Even now, key allies like Turkey who are supposed to be fighting IS and training ‘moderate’ rebels continue to support al-Qaeda and IS-linked rebels, yet are slavishly courted by the US and UK rather than reprimanded. Historians of MI5 and MI6 have documented that throughout their existence, entrapment has been a common practice used to foil plots that are to a significant extent laid out by the agencies themselves — often to target all sorts of democracy activists, from environmental protestors and antiwar campaigners, to nationalists and suffragettes. Much of this is to do with avoiding legal liability for potential consequences when the use of informants, or the effort to recruit them, backfires, as it appeared to do in the case of Lee Rigby. “There is nothing more treacherous than an informant,” said Thomas. Although MI5 to this day claims the 7/7 bombers had only entered the radar of the intelligence service on the periphery of another investigation, and not fully identified, police and intelligence sources confirmed that all four of the 7/7 bombers had in fact been identified and under surveillance. Thomas has previously criticised the security services on these grounds, and supported the call for an independent public inquiry into the London bombings. If these experts are correct, then far from making us safer, the new law will set Britain on the road to becoming a more paranoid and polarised society, vulnerable to another terrorist attack, where political dissent and freedom of speech are criminalised as threats to public safety. February 15, 2015 in Police State. Do you think the institution of draconian laws effectively disrupt Islamic extremism in Britain or will it push more young men towards radical Islam? Hi, thats an interesting question and i think Dan Glazebrook addresses it in his article on the ISIS recruitment cells within MI5 and the security police apparatus in the UK [and for that matter across Europe] http://www.rt.com/op-edge/271663-david-cameron-terrorism-islam/. I believe that all of these measures are designed to further ostracise and ghetto-ise Muslims in the UK and Europe. We are effectively being surreptitiously balkanised. The draconian laws affect us all, not only Muslims but the “dissidents” the “conspiracy theorists”…we are sliding into an Orwellian abyss from which it will be very hard to escape. Can you elaborate more on that please. But, really though. Do you think it will push young men into radical islam?